Did you know that the average American consumes more than 22 teaspoons of added sugar every day? That’s WAY more than the recommended amount. During the holidays, you can imagine how much higher that number rises! 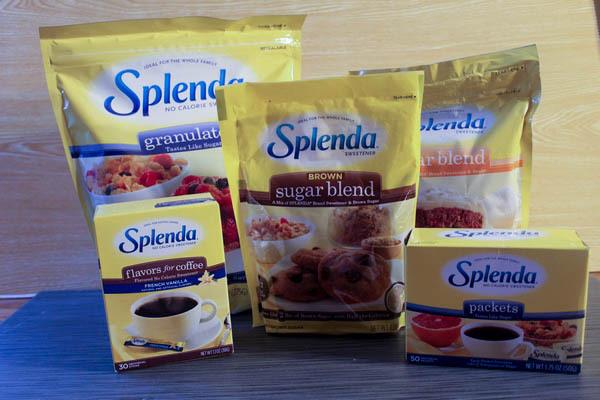 I’ve been using SPLENDA® for years to sweeten my coffee, tea and just about everything else. I actually carry it in my purse for when I’m at places that don’t have it. I wanted to come up with a fun homemade treat holiday gift idea for our big Christmas party. I’ve always wanted to make an “in a jar” gift, but never remembered to actually buy the jars. Well, this year, I was prepared! I bought a bunch of those little canning jars back in the summer and still have them. I don’t actually can anything, I was using them for bath soak recipes. 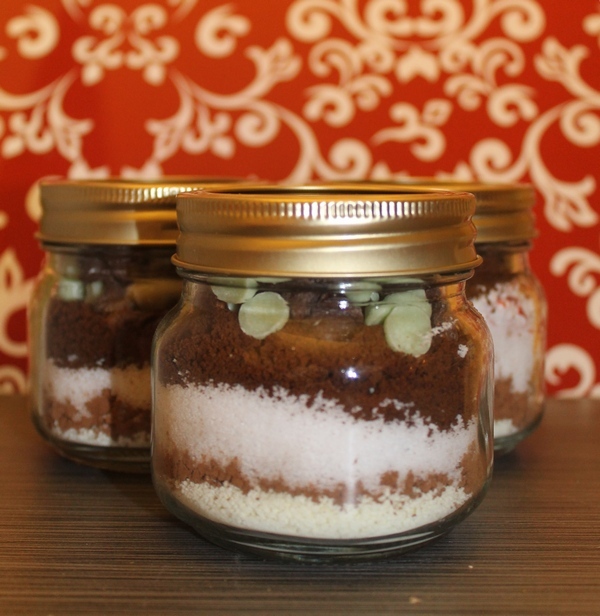 Since pretty much everyone in my family uses SPLENDA®, I came up with a twist on the hot cocoa in a jar gift. Check it out! 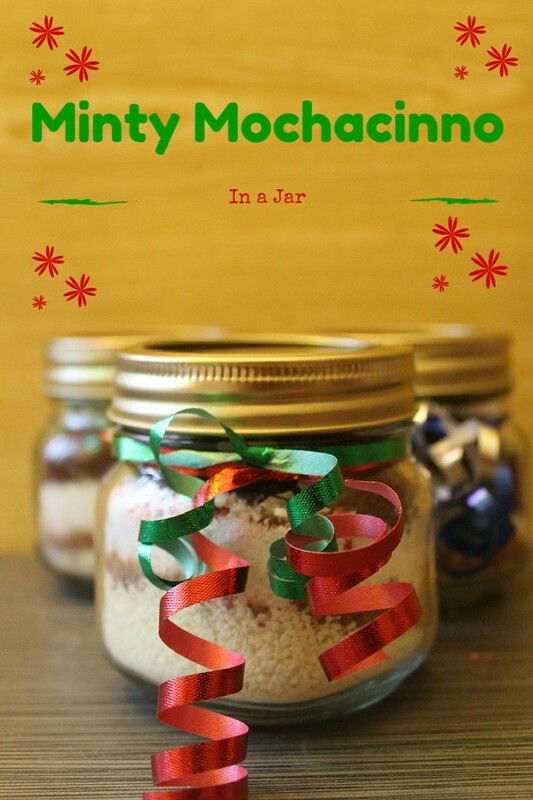 Note: the directions and ingredients are for 1/2 pint jars, perfect for gifting. If you want to use a quart jar, just change all the 1/4 cups into whole cups, quadruple the espresso and add more chocolate/mint chips. 1/8- 1/4 cup mint chocolate chips (the bag that combines both mint chips and chocolate chips). The amount depends on how sweet you want it and how much room you have left at the top. For some reason, even though I used the exact same amount in all my jars, I ended up with less room at the top of one jar. Simply layer the ingredients in the order listed. Be careful with this, you don’t want them to blend together. If you use the right amounts, you won’t have much room at the top, so no worries about the ingredients mixing in transit to your recipient’s house. Tie a pretty ribbon around the jars and you’re done! I had my mom do that step, because my ribbons looked horrible. Actually, I thought they looked okay until she did them. Hers were WAY prettier. Mine looked sad compared to them. Tell your recipient to add 1/3 cup of the mixture to a cup of boiling hot water and enjoy! SPLENDA® comes in so many varieties, it’s easy to create recipes with less added sugar! They even make SPLENDA® Flavors for Coffee! Yum! I’ll be trying their Brown Sugar Blend in my holiday cookies this year for the first time. I’ll let you know how they come out! Looking for more delicious SPLENDA® Sweet Swaps? Head over to Splenda.com for an entire library of ways you can use SPLENDA® in place of regular sugar, from simple swaps in your favorite coffee to incredible muffin recipes! What a cute idea! I have never used splenda but who couldn’t use a little less sugar intake around the holidays. Home made cocoa sounds yummy! This is a great little gift! I love that it’s sugar-free. I would love to try this for myself and a great gift for others as well.